Retro (No) Future was a game festival co-organized by Xavier Girard, One Life Remains and Pierre Corbinais (L'OuJeViPo) on October 5-20th 2013, at Visages du Monde in Cergy, France. Besides different events we've been working on, one of the major work was the exhibition we've curated altogether. 30 digital games from the past three decades were selected to embody the notion of "Retro (No) Futur", dystopian society, DIY culture, punk spirit and aggressive pleasure. 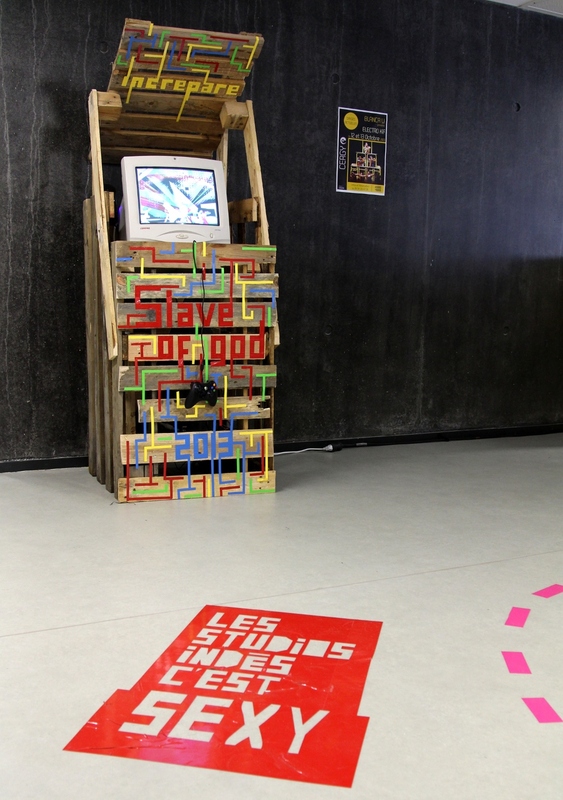 Inspired by digital artist Antonin Fourneau's SAT (Salle d'Arcade Temporaire), 30 handcrafted and customised wooden arcade cabinets have been produced with the help and support of Julien Fleureau and Labomedia to improvise and produce them all. Each unique cabinet where made outside in front of the visitors, while the festival was going on. For each of them, a special typographic design was made to emphasise the identity of the game regarding the theme of the festival. Images shot by Simon Bachelier or Xavier Girard. All rights reserved. "The Parisian collective pushes the genre limits by emphasizing the game concept before the technical achievement." by Marie Lechner, in Libération, 2013/10/10.